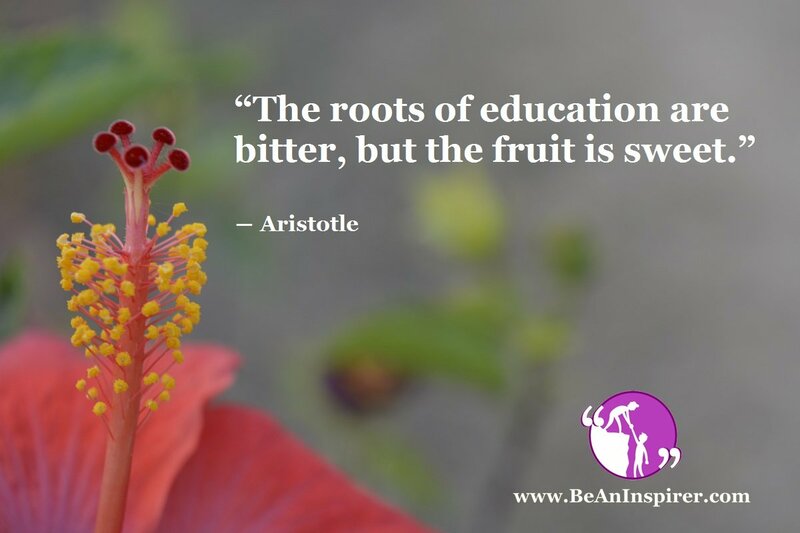 Greek philosopher, scientist, and Teacher Aristotle once said, “The roots of education are bitter, but the fruit is sweet.” The end of this quote is easier to understand than its beginning. The end fruit obtained out of education is indeed very sweet. Educated people are more empowered than the uneducated people. They are more effective in leading their own destiny. But, receiving education can be a painful process. It may involve years of devotion and patients. What does the Quote Mean? Aristotle was the teacher of Alexander the Great and many other great minds of his time. He understood the fact that to achieve education you need to make sacrifices and devote your precious time to the quest for knowledge. It might not be an easy task, and you may miss out many things in life. In time immemorial princes and young boys used to leave the luxury of their homes to live in the wilderness to receive an education. Education was meant to prepare them for life. Their teachers used to reside in forests or caves. In the midst of the dense forest, students were taught the basics of life, nature, world, and the Gods. Young boys used to stay years away from home to become an educated man. They had to face many hardships and tests to emerge victorious as assets to society. At the end of this tough journey, they used to find their glory in the promised careers and other areas. Education was a rare commodity, and it was valued immensely. Education in the present day is still tough and contentious though accessible to many. Schooling is mostly some of the most difficult years in a person’s life. In modern times students are not required to stay in the forest with minimal needs, but it still doesn’t lessen the struggle. The path to education is bitter. It is always difficult to learn new things. Education becomes increasingly onerous with every passing year. It takes many years to get educated. A child enters school at the age of four and leaves at eighteen in most cases. Higher education can take up to eighteen to twenty years of an individual’s life. Literacy and education are two very different concepts. Many people are literate, but a few are educated. Education means learning things to solve problems, while literacy only means a person who can read and write. Many people hate school as they do not like the subjects they are taught and other factors. But, education is the only way that can help you change your circumstances. Many times you will be faced with failure, but do not lose hope. The journey from failure to success is inspiring as well as eluding. Failure can be extremely bitter but, it is vitally essential for understanding the learning. Your biggest lessons are learned from failures in life. Years of trial and errors help carve an individual. Commitment and patients always give good results. Years of struggle to learn about the world helps in your life. Education involves studying facts, acquiring knowledge, and learning to socialize. It is always difficult to learn new things and also harder to change long held ideas and beliefs. Teaching and root learning is easy, but learning something to apply in life is hard. It takes a tremendous amount of cognitive efforts to use your gained knowledge and create something out of scratch. Education also means acquiring knowledge that can be applicable in the real world. The degree to which you can apply your knowledge says a lot about the quality of education you have received. READ ALSO: Why Be Afraid Of Mistakes?